I got my first Kindle in the summer of 2009. 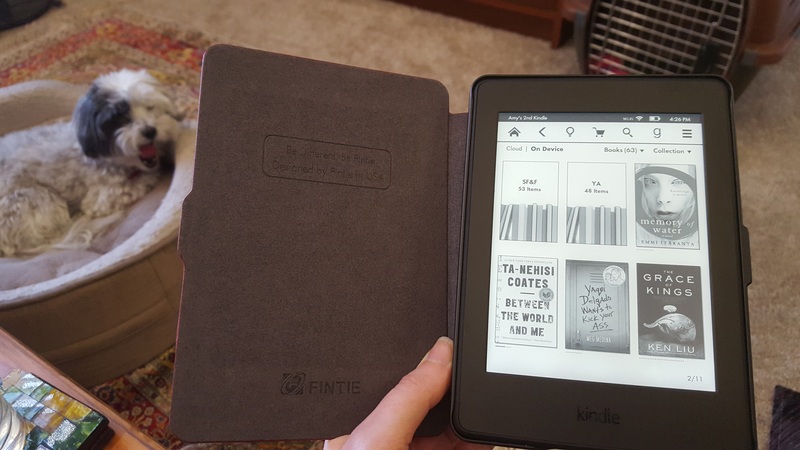 It was a birthday present after seeing my first Kindle at Wiscon (my first convention) at the end of May. I loved the idea of being able to have so many books in one device, but I didn’t embrace it enthusiastically until a few years later when I had to move. Suddenly the idea of not adding to the volume of books to be moved seemed like the best idea anyone had ever had. And since then, I’ve read much more on my Kindle. Fast forward six and a half years. In this day and age, that’s a good run for an electronic device, but this fall I began to notice my Kindle’s battery life was not what it once was. And then for Christmas, I received a Kindle Paperwhite. I love my Paperwhite! I love it so much! I hated setting it up, and I hated learning the basic UI, and I understood that I always kind of hate those things, and then I was done with them, and it was LOVE. It has an automatic light! I can read it comfortably in any lighting situation, from bright to pitch dark. When I was on the plane this weekend, I didn’t have to bring along an extra light. I didn’t have to turn on the overhead light. I could be lazy and read my novels in peace. The battery life seems to be okay even when its wi-fi is on. This was not true for my old Kindle, so I always had the wi-fi off. But with the wi-fi on, it is even faster and easier to buy new books, and also there’s a little blurb when you open a new book telling me what it’s about, which is great because I can’t always remember why I bought the book in the first place. I can see book covers again! My old Kindle was all text, showing only titles, but now I see a beautiful display of book covers, which also helps remind me what these books are. There are options for measuring your reading! You can pick between page number, time left in the book, and time left in the chapter. I keep switching back and forth because I love them all. The time left feature is great because it allows me to plan my reading better, and no surprise, I adore anything that lets me plan smarter. Touch screens are cool. I understand we’re already kind of accustomed to them, with smartphones and smartpads and everything else, but seriously, they are cool.